Straight quotes make it quick and easy to express a thought. You don’t have to be a typographer to make yourself understood. In the right situations, “dumb quotes” are a smart idea. Smart software tries to figure out what punctuation should be used based on context. A quotation mark that follows a space is probably an open quotation mark. 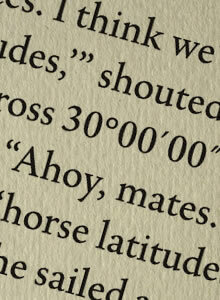 A quotation mark that follows a period (at least in North America) is usually a closing quote. A single quote in the middle of a word is most likely an apostrophe. Smart quotes work most of the time, but they don’t fare too well with my example sentence. And this is one more reason a typesetter must go through the book block line-by-line, paragraph-by-paragraph: It’s the only way to find and repair typographic inaccuracies that can make a book appear amateur and unprofessional. To make things easier, most word processors and typesetting programs have a “Special Characters” palette. Find the character you want and click to insert—easy. Otherwise, quotation marks and primes have “escape sequences” that allow you to insert them from your keyboard. 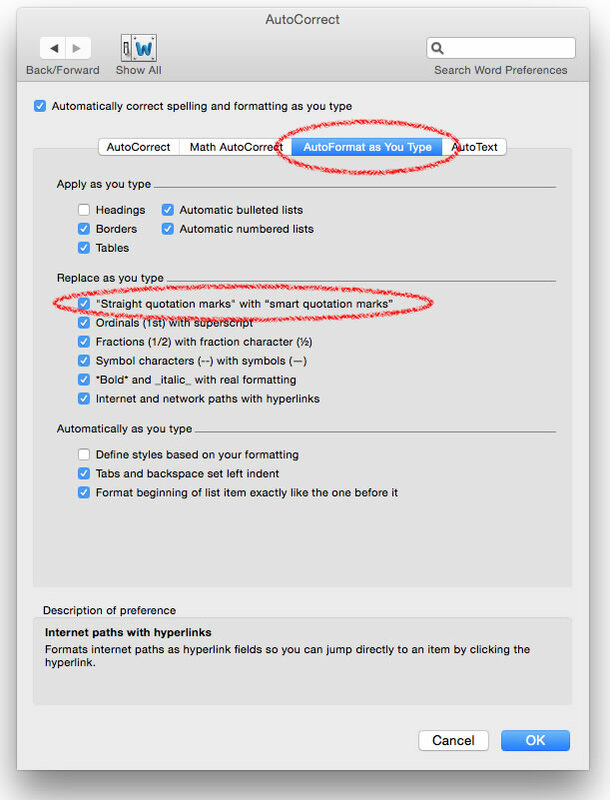 The Preferences dialog in MS Word enables you toggle “smart quotes” and other features on and off. Take a look at these settings and decide which ones you want to use or you’ll tear your hair out trying to figure out why Word keeps changing everything you type. If you wrote your manuscript with smart quotation marks turned off, you may end up with straight quotes and apostrophes all through your book. This is easy to fix. Make sure “smart quotes” are turned on. Then perform two find and replace operations: Search for apostrophes/single quotes and replace them with the same. Then search for double quotes and replace them with double quotes. As the “replace” function “retypes” your characters, the “smart” quotation marks will be substituted for the straight ones. ALT 2033 does not make a double prime in Windows. According to Wikipedia, accurate and reliable source for all things true: Under Windows, the Alt key is pressed and held down while a decimal character code is entered on the numeric keypad; the Alt key is then released and the character appears. If you’re using the keypad and this doesn’t work, let me know when you find the solution. I don’t do windows. You're right with the procedure, Dave. However, fact is that the post simply shows the wrong numeric [4 digit] sequence to come up with single prime or double prime in Windows. The HTML code is correct. (1) Use ALT 0146 or ALT 0147 to come up with single prime or double prime. (2) Use the same numbers as in HTML. ALT 8242 or ALT 8243 give you the same result. Again, we talk about Windows OS here, right? Help is appreciated. I’ve been a mac user since 1987 and have never spent much time on Windows. 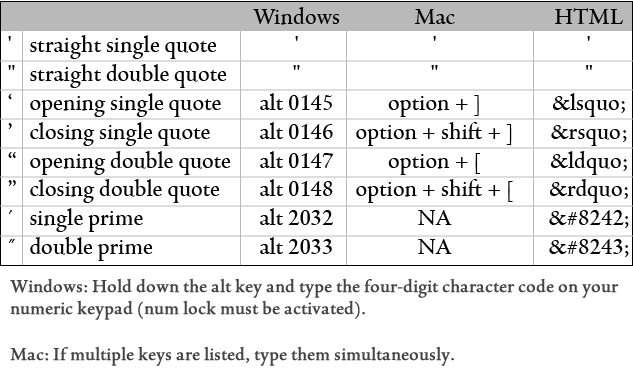 Usually, I gripe about Windows’ complicated escape sequences, but Mac doesn’t even have keystrokes to access some of these important typographic necessities. Most of the world will get along with straight quotes. The rest of us will probably use the glyphs/special characters panel as it’s the bets choice of several bad options. This was an interesting post. I thought straight vs curly quotes had more to do with the font than with their use in the sentence.